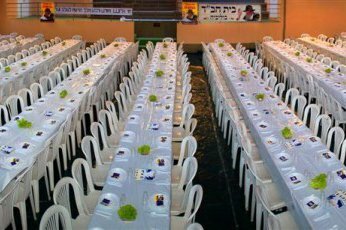 (JTA) -- Some 650 rabbis from the Chabad-Lubavitch movement will conduct communal Passover seders in 58 countries. The "Roving Rabbis," as the young rabbis and rabbinical students are known, will conduct some of the world's largest seders in Katmandu, Nepal, and Cuzco, Peru. They also will hold seders in countries from Angola to Kazakhstan, and Rwanda to Zambia. “The goal of this program is to give every Jew, no matter where he or she may be, the opportunity to participate in a seder," said Rabbi Moshe Kotlarsky, the vice chairman of Merkos L’inyonei Chinuch who oversees the program. "The young rabbis make the Pesach experience accessible, inviting and relevant to every Jew, everywhere." The Passover initiative also supplied grants to fund seders and Passover activities in communities around the world. Thousands of public seders are being put on by Chabad Houses around the globe.